Banff, Alberta – Experience the awesome beauty and power of the Canadian Rockies with our impressive “powder hounds” in Banff National Park! Snowy Owl Sled Dog Tours shows you some of the most amazing sights in Banff, Alberta like you’ve never seen them before. Our world class dog sled tours give you an incredible opportunity to explore Canada’s most extraordinary national park while bonding with real Canadian huskies. Our one-of-a-kind dog sledding journey begins with an informative history lesson and safety chat (30 minutes) and ends with a traditional Canadian Rockies campfire experience complete with hot beverages, story telling and of course our famous “mystery cookies.” Along the way you’ll be accompanied by our expert guides and charismatic pups. We’ll show you some of the most spectacular landscapes in Banff National Park: snow-capped peaks, peaceful valleys, charming bridges and icy lakes are all within your reach on this amazing Canadian Rockies dog sled tour. Snowy Owl Sled Dog Tours brings you hands down the best all inclusive family, group and single programs in Banff, Alberta. Daily tours depart from our trail head in the Spray Lakes at 9 am, 11 am, 1pm and 3 pm. Trail length is approximately 10 km. Adults $149; Youths (6 – 9) $80; Children (2 – 5) $30; Infants (under 2) $20. Ask about our Exclusive Signature packages. 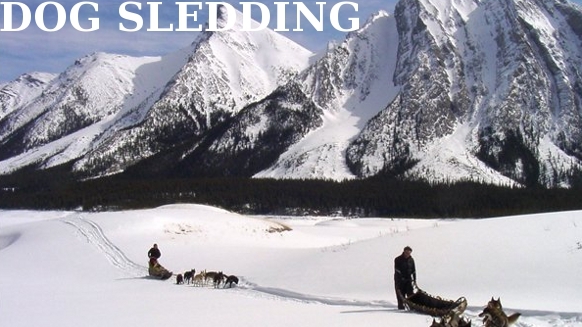 Gift Certificates are available for all Snowy Owl Sled Dog tours. Please contact us for more information. Want to see what the weather is like in Banff, Jasper and Canmore? Check out our webcams at Rockies.com!